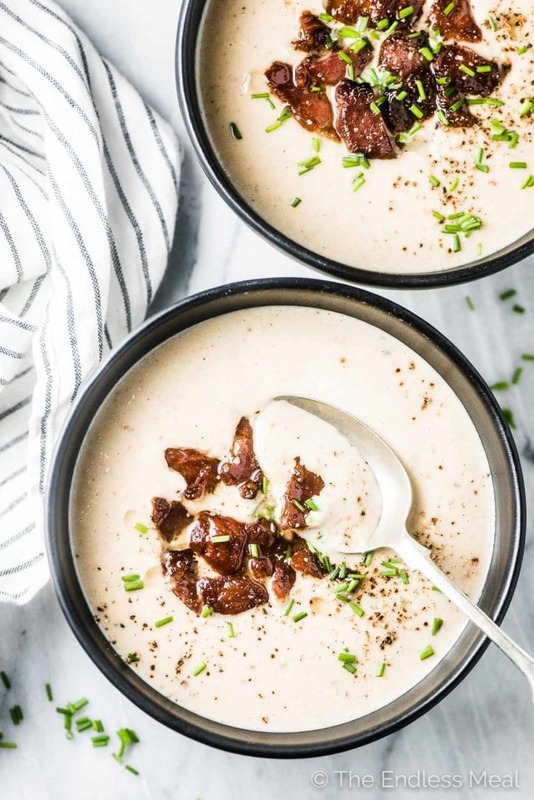 Bacon and cashews are blended right into this Paleo Cauliflower Soup recipe which makes it super creamy and delicious. It's a low-carb and Whole30 soup recipe that everyone will love! The determination to eat clean and be healthy is at an all-time high. It's freaking cold outside and comfort food is king. Trying to make amends with your clean eating dreams and your comfort food wants might seem next to impossible, but I've got you covered. A big bowl of creamy soup that tastes like you've poured a carton of whipping cream into it. Not a spot of dairy in sight. It's a pot of low carb (keto!) magic. 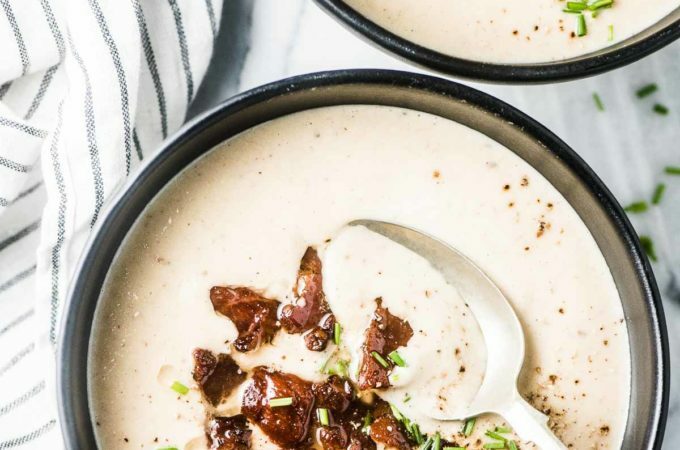 You can dig into this cauliflower bacon soup while keeping your resolutions AND satisfying your inner cozy food cravings. The best of both worlds! 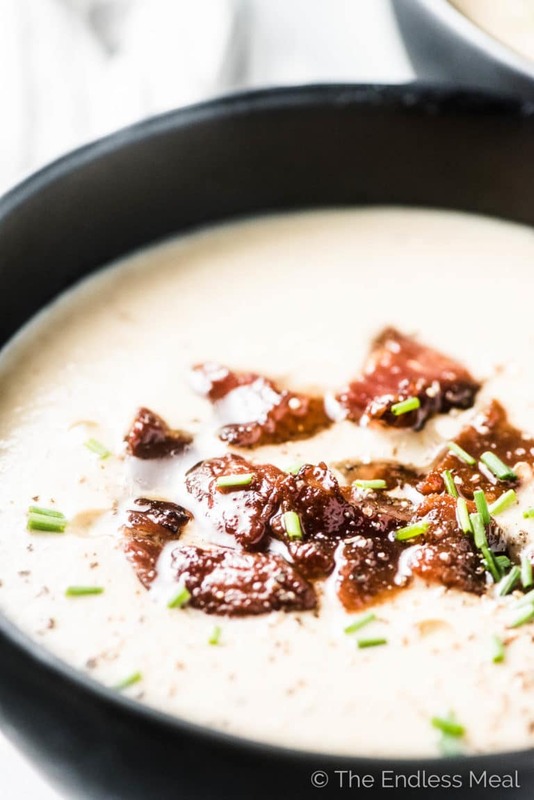 Can it even be called cauliflower soup if it doesn't have bacon in it? Ok ok technically I have shared a curried cauliflower soup recipe with you years ago and bacon was not in the ingredient list. That soup was good, but bacon makes everything better. Where to find paleo bacon? The only problem with bacon is that it is often cured with nitrates and sugar. Most of us who lean towards a paleo lifestyle try to avoid those two things as much as possible. And if you're doing a round of Whole30, they're definitely out. Luckily, it is possible to find paleo/ Whole30 compliant bacon. Often well-stocked health food stores (like Whole Foods and Trader Joes) will carry some. You'll find it less often at your regular grocery store. Yep, they're at it again. You've seen them recently in the Cashew Coconut Salmon Curry and a little farther back in the Dairy-Free Pork Chops and Mushroom Soup. 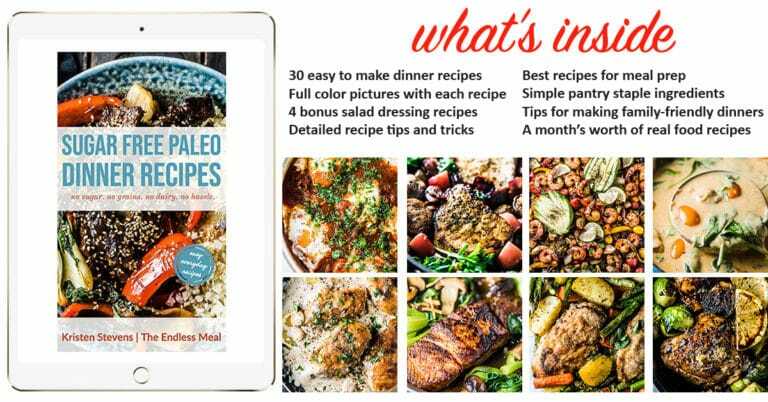 They've also made an appearance in a couple of the recipes in my Sugar Free Paleo Dinner Recipes cookbook. Blending raw cashews into the sauce (or cashew butter if you don't have a high-powered blender) mimics adding cream. It creates a sauce or soup that is truly magical! 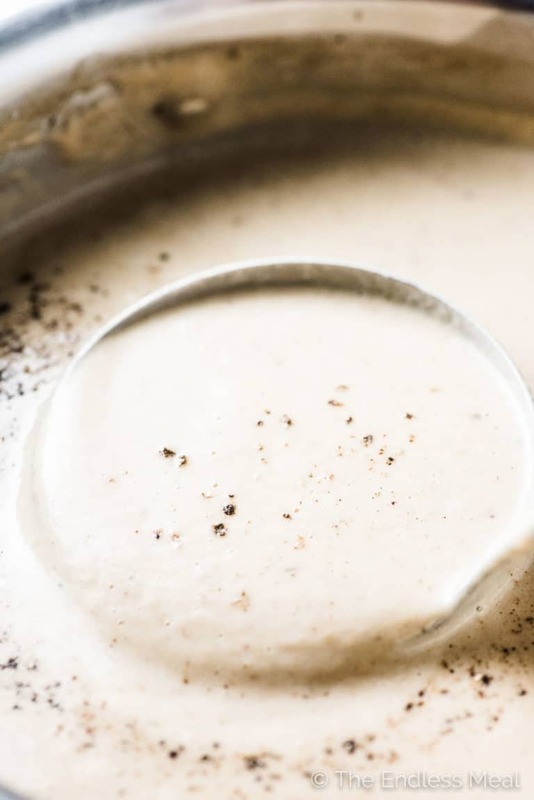 If you love recipes like this Paleo Cauliflower Soup, make sure to check out my cookbook Sugar Free Paleo Dinner Recipes! Place the cashews in a jar and cover them with hot tap water. Cook the bacon until crispy in a large pot over medium-high heat, about 8 minutes. Remove the bacon with a slotted spoon and drain off all but 2 tablespoons of the oil. Add the onion to the pot and let it cook for 5 minutes. Add the garlic and cook for 1 minute more. Add the cauliflower, chicken stock, thyme, and pepper to the pot and bring the pot to a boil. Reduce the heat and simmer for 15 minutes, or until the cauliflower is soft. Drain the water from the cashews and add them to your high-powered blender. Add half the bacon and half the soup and blend on high until smooth. Pour the soup into a new pot then blend the remaining soup. Season the soup to taste with sea salt. Serve the soup topped with the remaining bacon, some chopped chives, and a little black pepper. If you don't have a high-powered blender (like a Vitamix) skip Step 1 and use 1/4 cup of raw cashew butter instead. 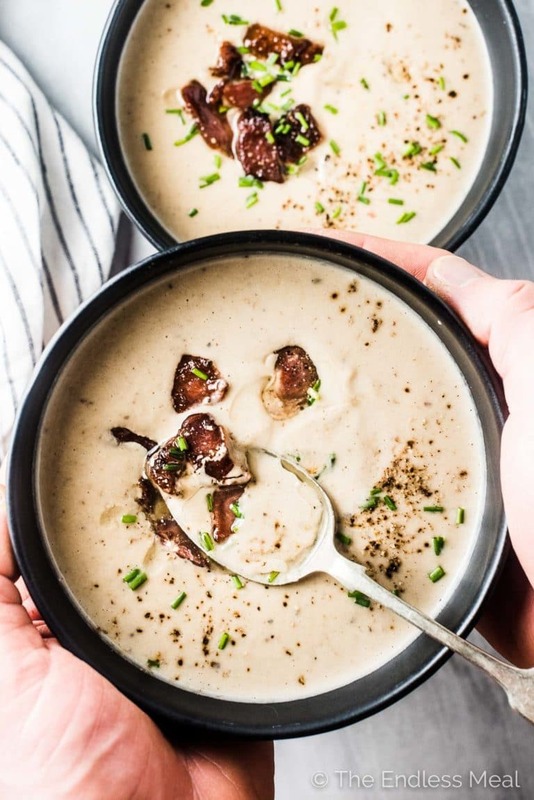 If you like Whole30 recipes like this Whole30 Cauliflower Soup, check out my cookbook Sugar Free Paleo Dinner Recipes! Hi! Looks delicious! A quick question about the nutritional information: am I correct in understanding that one serving (1/4 of recipe) has 40g of fat? That is right. Cashews are high in healthy fats! This soup freezes really well! I’m so happy to hear you like the recipe! Looks delicious. I’m allergic to raw cashews, but can eat them when cooked. Do you believe it would hurt the recipe to cook the soup a little longer once the cashews have been added?